The power and instability of the financial system, fuelled by decades of deregulation and liberalization, have been demonstrated impressively by the current financial crisis. Some commentators see in this system a disembedding of society and markets, predicting a new Polanyian ‘double movement’ that returns power to the state. However, the idea of the ‘powerless state’ is not applicable, as states consciously embedded their citizens in the financial markets in order to shift social welfare responsibilities to individual asset-owners. This gave financial markets control over financial dynamics, which was used to create profits through innovation and disproportionate risk-taking. As a consequence, small changes in financial variables caused the international financial crisis, and governments felt compelled to bailout overleveraged financial institutions deemed ‘too big to fail’. Hyman Minsky described many of these developments in his ‘financial instability hypothesis’. 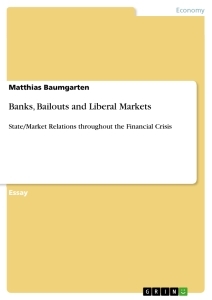 As bailouts are only temporary measures to uphold the status quo, he calls for increased state control over the financial markets in order to prevent excessive speculation in the future. Many regulatory proposals created following the onset of the crisis echoed this demand, envisioning a paradigmatic shift that could reverse the trend of deregulation in pre-crisis years. However, the reliance of the state on the financial sector to support the system of ‘asset-based welfare’ proved to be resilient enough to withstand the initial crisis. Now, signs of recovery create new priorities that displace demands for financial regulation. The financial markets thus retain their central position, albeit with a few self-regulatory obligations, and a change in state/market relations is unlikely to occur. The current financial crisis shook the foundations of the entire international economic system. This should come to no surprise, since decades of neoliberal deregulation have enabled the financial markets to effectively become an essential part of this foundation (Cerny 1994:320-1). Some commentators argue that society is again disembedded from the markets and predict a new ‘double movement’ (Polanyi  2001:79), reigning in the power of the financial markets and shifting the balance in state/market relations in favour of the former. Conversely, I argue in the first section of this essay that the idea of the ‘powerless state’ is not an adequate starting point to judge the impact of measures in response to the crisis. Concentrating on the industrial economies at the core of the crisis, I illustrate the conscious political efforts that supported the growth of the financial markets and the current economic setup. Policies were designed to embed society in these markets, in order to shift welfare responsibilities from the public domain to ‘responsibilized’ citizens. While dependent on the public’s consumption, the central position of the financial markets in this constellation enabled them to control financial dynamics. Increasing intermediation and profit-maximizing innovations like derivates, which Warren Buffet famously dubbed “financial weapons of mass destruction” (cited in Blackburn 2008:81), have made these markets increasingly volatile. The late economist Hyman Minsky depicts an inherent speculative bias in financial markets in his ‘financial instability hypothesis’, leading to periodic financial breakdowns (1982:13). The resemblance of the crisis and his hypothesis led some commentators to proclaim a ‘Minsky moment’ (Lahart 2007). Indeed, small changes in economic variables were sufficient to unleash the financial crisis, which is analyzed in section two. States reacted to the breakdown with massive public bailout programmes for financial institutions deemed ‘too big to fail’. Minsky saw public bailouts as necessary aspects of the state’s lender-of-last-resort function, yet I argue that these only represent temporary measures to upkeep the present economic system. Accordingly, in order to stabilize this system in the long-term and prevent future speculative excesses, Minsky calls for regulation that increases state control over the financial sector. A vast number of propositions for regulatory change developed at the beginning of the crisis echoed these demands, a selection of which is presented in section three. However, the institutionalized embedding of society in the financial markets has been resistant enough to withstand the immediate crisis period, as the final section highlights, and growing signs of recovery are now undermining demands for a paradigmatic shift (Blyth 2011). Governments are returning to the pre-crisis setup as different priorities, especially the need for fiscal austerity, are becoming policy priorities. Financial markets therefore retain their central place in the economic system, albeit with some measure of self-regulatory obligations. Nonetheless, any substantial change in state/market relations is unlikely to occur. The magnitude of the financial crisis is an obvious consequence of the instability and power of global financial markets, the latter leading many commentators to emphasize the dominance of market forces over state and society in today’s neoliberal economy (e.g. Strange 1996). However, I argue that focussing narrowly on market power obscures the state’s active role in shaping current socio-economic relations. A conscious effort is made to create a ‘financial society’, whose individual members are deeply embedded in the financial markets. Nonetheless, deregulation and institutional complexity gave financial markets a disproportionate amount of control over financial dynamics. As a consequence, innovation led to the spread of risk throughout the system and weakened the financial foundations of banks and ordinary citizens. ‘Embedded liberalism’ is Ruggie’s (1982:392) famous term for the post-war Bretton Woods system, which came into being as a consequence of social counterforces reversing the rule-based austerity mechanism of the classic gold standard (Polanyi  2001:71,79). Consequently, capital controls granted the state a large amount of policy autonomy, used to increase social security and support employment via Keynesian demand-side economics (Keynes  2008:25-9). But the end of the Bretton Woods system and a subsequent inflationary crisis provided a historical moment for neoliberal policies to take hold and become orthodox thinking (Crouch 2009:388-9, Eichengreen 1998:134,141). These policies include the reduction of ‘inefficient’ state involvement through deregulation of product, labour and especially capital markets (Gamble 2009:95). Looking at these developments, widespread ideas like the ‘capital mobility hypothesis’ portray the state as helpless follower of the structural power of increasingly mobile capital (Andrews 1994:203). Accordingly, deregulation is involuntarily pursued by states in order to remain internationally competitive, strengthening the class of financial capitalists (Cerny 1997:259-60). As governments place increasing importance on capital movements over labour movements (Crouch 2009:389), some scholars claim that the new neoliberal era has again disembedded the social and the economic sphere (Altvater 2009:76). However, in my view this interpretation is not an adequate starting point to analyze current financial developments, as it ignores the substantial interest states have in the expansion of the financial sector. Contrarily, I argue that governments, especially in the United States (US) and Britain, did consciously shape the new neoliberal supply-side growth model with the financial markets at its core (Gamble 2009:13). The ideas surrounding deregulation were specifically promoted as an alternative to the chaotic post-Bretton Woods situation (Schmidt 2009:535-6), leading for example to the 1986 ‘Big Bang’ of banking liberalization in the City of London (Plender 1986:44-6). But the social compromise of Bretton Woods had created a dependence of capitalist growth on increasing citizen consumption (Crouch 2009:384). As initial efforts to promote saving in the post-Bretton Woods era depressed demand, the solution was found in consumption based on debt rather than income (Wray 2010:263). Conscious efforts have therefore been made specifically to embed society in the financial system (Watson 2007:217). A vast number of states changed their central bank statutes to increased independence, making low inflation and the conservation of financial values a key priority (Burnham 1999:47-9). What Blackburn calls ‘Market Keynesianism’ (2008:66) was therefore based on both strengthening the financial sector as well as inflating consumer purchasing power, in order to reconcile capitalism’s inherent contradictions via market mechanisms (Holmes 2010:387-8). This dual system functioned, because “what is invested in an advanced economy is not money but credit, and credit can be created” (Strange 1994:30). The banking sector created this credit, enabling citizens to invest in asset-based products. As these products could increase in value without fuelling inflation, asset ownership was incorporated into public policy (Crouch 2009:391-2). The emerging system supported ideas of ‘asset-based welfare’, designed to shift the responsibility for welfare payments from state-led transfer programmes to the investment activities of individuals (Watson 2011:3,15). ‘Responsibilized individuals’ were given easier access to credit by programmes like the US Community Reinvestment Act of 1977, which encouraged lower-class investment in the liberalized housing market (Barr 2005:110-3). The high demand for mortgages in turn stimulated the financial sector and released income for citizens to engage in consumption (Schwartz 2009:185-6, Holmes 2010:310). Impressive growth rates with low inflation seemed to confirm the success of this ‘Anglo-American’ finance model (Gamble 2009:18). However, while citizens were increasingly embedded in the financial markets, control over market dynamics and the pricing structure concentrated in the hands of financial market actors, especially global banks (Langley 2002:319, Watson 2007:217). Minsky predicted that a financial structure dominated by conservative finance offers banks incentives to engage in speculation (1982:26). Faced with falling profits in traditional business segments, the low interest rates in the period from 2001 to 2006 presented an opportunity for banks to increase leverage and risk exposure in order to develop lucrative and innovative financial products (Blackburn 2008:67-9). Two categories of financial innovation clearly dominated the pre-crisis financial system: defensive innovation, occurring in response to policy and regulatory changes, and aggressive innovation, referring to the development of products for new markets (Llewellyn 1992:28-31). The main defensive innovation was the abundant use of ‘special purpose vehicles’ (SPVs). These corporate entities were created and controlled but legally only loosely related to their sponsoring firms, allowing banks to avoid capital requirement regulations (Gorton and Souleles 2005:550,559). They were combined with the primary aggressive innovation, collateralized debt obligations (CDOs) and specifically mortgage-backed securities (MBSs). The booming mortgage market due to the promotion of ‘asset-based welfare’ multiplied the number of MBS issues. These were transferred into highly leveraged SPVs, exploiting interest rate spreads or selling the securities to clients (Schwartz 2009:183-4). The latter, known as ‘originate-to-distribute model’, enabled banks to pass on the risk of default of the underlying mortgages (Brunnermeier 2009:82). Contrary to official proclamations that these risk-related innovations have “helped to make the banking and overall financial system more resilient” (IMF 2006:51), they created inherent instability. They were build on the expectation of continuously rising asset prices and demand (Schwartz 2009:187), what Minsky dubbed ‘Ponzi finance’ due to its extreme reliance on favourable market conditions (1982:22-3). More consequential still, MBS were not openly traded on markets and therefore lacked objective pricing. According to the Financial Accounting Standards Board (FASB), these “unobservable [level 3] inputs shall reflect the reporting entity’s own assumptions” (2006:12). ‘Marking-to-model’ instead of ‘marking-to-market’ allowed banks to value securities according to their own models, while adept structuring earned even subprime MBSs investment grade (AAA) credit ratings (Brunnermeier 2009:80-2). Trust in the valuation of these derivates therefore allowed the long-term sustainability of a system dependent on unsecured debt (Crouch 2009:392). Yet ‘Market Keynesianism’ did not remain localized, as global interdependence and the ‘originate-to-distribute model’ spread the new products to banks and investors around the world (Gamble 2009:22). The high proportion of intra-industry trades converted banks and investors into a massive ‘institutional complex’ (Blackburn 2008:72,92). At its height in 2007, total outstanding mortgage debt equalled $11.1 trillion (Schwartz 2009:179). Summing up, the rise of the financial markets was accompanied by conscious state efforts to embed citizens in these markets as consumers, investors and holders of debt. Favourable conditions led financial institutions to use the growing mortgage market in order to create financial innovations and reallocate risk. Yet instead of gaining stability, banks became increasingly vulnerable and ultimately proved ‘Market Keynesianism’ to be unsustainable (Crouch 2009:382). Die FDP als liberale Partei? Die Liberalen zwischen Verfassungskonflikt und "liberaler Ära"
Die Innovation Market Analysis - Ein alternatives wettbewerbspolitisches Leitbild?